Travel rewards with no annual fee. Earn an unlimited 1.25X miles per dollar with plenty of redemption flexibility. Redeem miles for travel statement credit that allows you to book travel anywhere at any time, with no blackout dates. This card is one of our picks for the best credit cards of 2019. 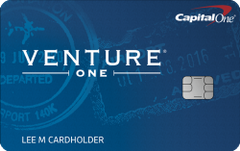 Our take: The VentureOne card from Capital One is a good pick for cardholders who want rewards-funded travel, but don’t want to deal with blackout dates or complicated rewards schemes: In lieu of complicated bonuses, the card awards 1.25 miles on every purchase and it allows you to book your rewards-funded travel yourself from any website or travel agent you choose.